I’m driving north on Euclid, past the Boondocks Bar, ads for square dancing and “We Buy Broken Gold…” A billboard for the Roadrunner Gun Show at the Tucson Expo Center flashed past while KUAZ-FM interviewed a group calling for more stringent background checks for gun purchases. Heard an elf owl calling last night – sounds like a squeeze toy. This morning, I saw cactus thrush, goldfinches and pyrrhuloxias at a birdfeeder, quail beneath. It’s very quiet this morning outside the Safeway where the shooting took place. 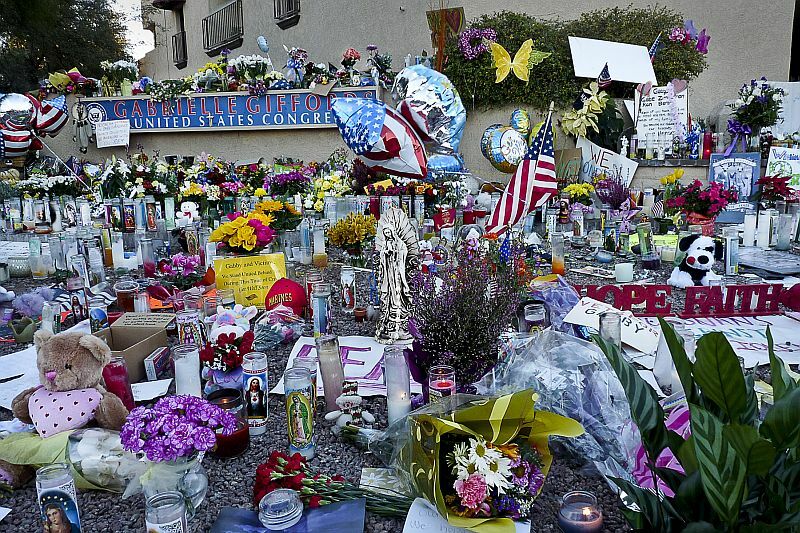 I asked an older woman, who was putting pots of white-flowered oxalis into the backseat of her four-door, about the memorial shrine that local people had created in the parking lot to honor the shooting victims. “It was all along there,” she said, sweeping her hand towards the Safeway entrance, “and flowers and candles all at the corner. But they’ve taken them down.” Referring to Giffords, she pointed to the grocery store’s north door. “She was shot right there, where that woman is now. There are gouges in the concrete in the area around the north door to the Safeway. I walked the rest of the mall’s sidewalks. No other portion had similar gouges. Presumably, they’re bullet holes. Inside, at the Safeway deli counter, I ordered a grilled chicken sandwich from Arlene, according to her nametag. I asked her whether the shooting had been bad for business. “Safeway closed for a week,” she said, “and for a while business picked up. – Because we had a lot of gawkers,” she added grimly. I drove to Christina-Taylor Green’s school, Mesa Verde Elementary, “Home of the Mountain Lions” and just a few minutes from the grocery store. Today, Mesa Verde’s marquee announces that it’s “Yo-Yo Week.” The wind is stirring the flags in front of the school. Small kids are walking in line behind a teacher. Spring birds pop into holes in the saguaros along Sage Street. 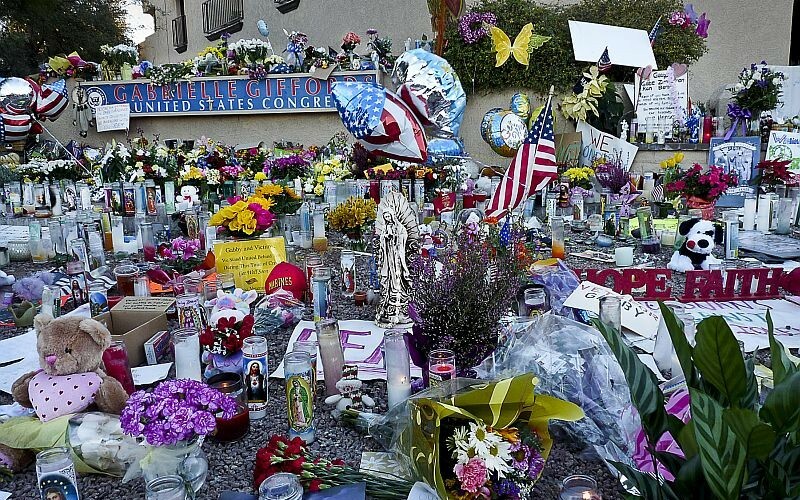 After the January 8th shooting, the primary school’s chain link fence was covered with memorial tributes and mementos. No shrines here now, but I saw a Ben’s Bell with a red clay butterfly hanging in a palo verde tree near the school’s entryway.